4 The Journal of Commerce | October 15 2018 www.joc.com Mark Szakonyi WITHOUT THE BILLIONS of dollars invested by the Chinese government on the China-Europe rail network and the subsidizing of container- ized shipments, there's no way the transport mode would be enjoying its staggering success. The network — which offers shippers a speedier option than ocean shipping and cheaper alternative to air cargo — has evolved from a series of single shipper-driven services to more than 50. 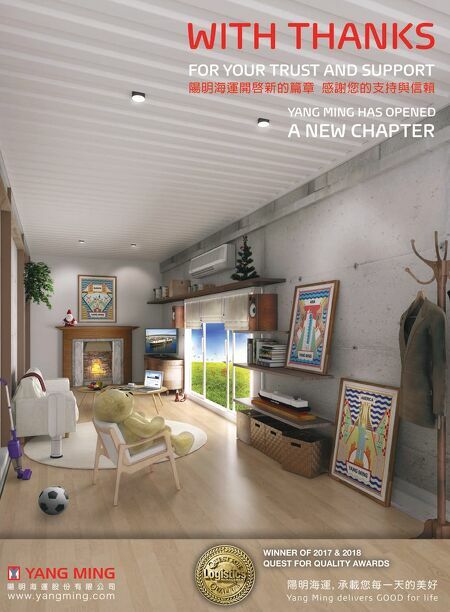 And, although growth is decelerating, shippers' attraction to the mode isn't, with volume rocket- ing from 1,400 TEU in 2011 to nearly 319,000 TEU in 2017, according to figures from mainland China rail entities and state media. But there's no such thing as a free lunch, or as the free-market axion is translated in Mandarin, "Wool comes from sheep's back." The point is that while the subsidies have fueled container volumes, jock- eying by various local governments to boost the network via subsidies also hasinjected inefficiency and uncertainty into the system. Subsidy support has shifted from the central government to local governments, with newer entrants in the competition for more train starts able to push heavier subsidies than the likes of Chengdu and Chongqing, which are coming to the end of a five- year tapered subsidy plan. Subsidies range from $1,000 to $5,000 per FEU, according to the Center for Strategic and International Studies (CISI) in Washington, D.C. Westbound rail rates for an FEU weighing about 9,600 kilograms (21,164 pounds) are in the $6,000 to $8,000 range. That same shipment would cost about $3,000 via ocean. One city's delayed release of sub- sidies this year frustrated requests for proposals, noted Felix Heger, vice president and global head of ocean freight and China rail at DHL Global Forwarding. The nature of subsidies also is changing, with more money being spent to prop up truck hauls to Chinese hubs, and real estate de- velopers pushing subsidies to drive warehouse projects near rail hubs. At the same time, word is filtering down from Beijing that the central government isn't pleased with how local subsidies are being awarded, prompting speculation that a top-down system will be imposed on local governments. Speaking at the JOC Container Trade Europe Conference in Ham- burg, Germany, in September, Heger joined fellow rail providers in ex- pressing confidence that subsidies of some form would continue. Even if subsidies decline to $2,500 per FEU and volume doubles by 2027, the annual subsidy price tag nears $927 million, Jonathan Hillman, director of the Reconnecting Asia Project at the CSIS, wrote in a March analysis. "Given the political importance China has attached to these routes, this spending could be justified as advertising for" the Belt and Road, he said, referring to the multibillion-dol- lar proje aimed at linking Asia with Europe and Africa, and the countries in between via water and land routes. The subsides are playing a role in network efficiencies. Worsening infrastructure bottlenecks have extended transit times from 11 to 12 days to 17-19 days, depending on origin and destinations and varying speeds of services, with some ship- pers reporting delays in transit of more than a week. European infrastructure and surging volumes are partly to blame, but so are subsidies in that they allow local governments, often not versed in logistics, to prioritize train starts over utilization. The central Chinese city of Xian, for example, wants to boost its annual train starts from 180 to more than 1,000, an effort that will cost some $250 million, or a $4,500 subsidy per container, in order to compete with rates out of Chengdu, estimates David Smrkovsky of Chinese forwarder JUSDA, which is owned by Foxconn, the world's largest contract electronics manufacturer. In short, containers on the system often move empty — with estimates of three laden westbound containers for each eastbound one — and trains often depart with a load of 40 FEU instead of the maxi- mum capacity of 60 FEU. Smrkovsky recalls how single pallets of bottled German water were placed in each container on one eastbound service so they could be counted as laden. Utilization inefficiencies such as that put unneeded pressure on an already overburdened network and are a sharp contrast to how North Amer- ican Class I railroads, generally seen as best-in-class globally, are running longer trains. For shippers, the subsidies are a clear boon, but while they may be free to them, they are contributing to a sour aftertaste of longer transits and pricing uncertainty. JOC email: mark.szakonyi@ihsmarkit.com twitter: @MarkSzakonyi Wool comes from sheep's back The Journal of Commerce (USPS 279 – 060), ISSN 1530-7557, October 15, 2018, Volume 19, Issue No. 21. The Journal of Commerce is published bi-weekly except the last week in December (printed 25 times per year) by JOC Group Inc., 450 West 33rd St., 5th Floor, New York, N.Y. 10001. Subscription price: $595 a year. Periodicals postage paid at New York, N.Y., and additional mailing offices. © All rights reserved. No portion of this publication may be copied or reprinted without written permission from the publisher. POSTMASTER: Please send address changes to The Journal of Commerce, Subscription Services Department, 450 West 33rd St., 5th Floor, New York, N.Y. 10001. 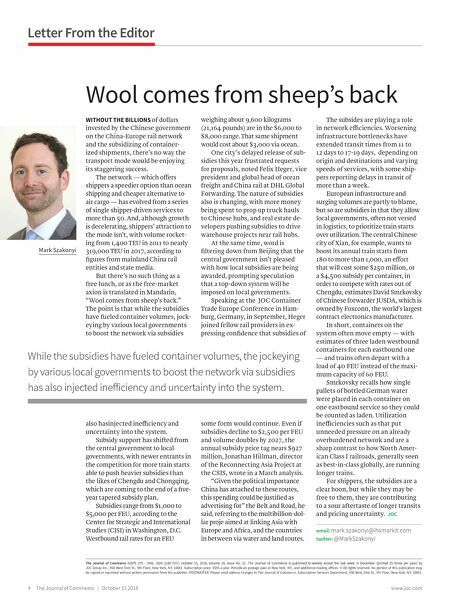 Letter From the Editor While the subsidies have fueled container volumes, the jockeying by various local governments to boost the network via subsidies has also injected inefficiency and uncertainty into the system.